Go into a bookstore and what do you see? Row upon row of soon-to-be-forgotten titles. That's not the case with this book. It is a classic! 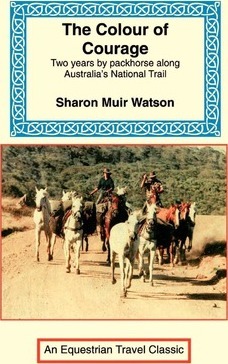 "The Colour of Courage" is the remarkable true story of the epic horse trip made by famed Australian equestrian explorers Sharon Muir Watson and Ken Roberts. During the course of their mounted journey the young friends discovered enough adventures to satisfy even the most jaded reader, ranging from riding through leech-infested jungles to trying to herd their horses through some of the toughest terrain on earth. Yet, if many of these pages are testaments to courage, other sections carry the reader away to the forgotten corners of back-country Australia. For Ken and Sharon are not just horse people. They are the dust of Australia given a voice. Here are the old drovers recounting lost stories. Here are the little people of a big land recounting their tales. And here are two young people alive with vitality, ablaze with bravery, and determined to ride the length of an inhospitable country on a do-or-die journey. Ken and Sharon were the first to ride Australia's 5,000 kilometer long Bicentennial National Trail. They will not be the last. But what is certain is that this book, and their legendary ride, will never be forgotten. For these two brave explorers opened the door to the rest of us, and left this spell-binding story to show us the way.